Today we've been working on a strange RFI (radio-frequency interference) problem. Inspired by Juha's recent investigations and wishing to resolve this problem so as to hopefully clean up our own data, we've gone back to start working on this problem again. The first step is to actually understand what we have. Initially, the problem was noticed by Antti during some of this data reduction work on the riometry data that we've been taking. However, others have seen it as well in astronomy experiments. 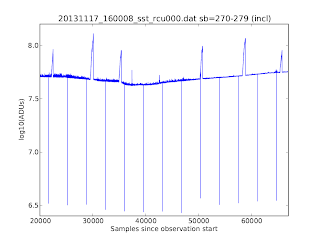 So far the problem has only showed up on the low-band antenna (LBA) array, but we're trawling data as this is being written so as to see if it occurs in higth-band data too. The characteristic of this effect is a gentle rise in RF power, followed by a sudden drop. In order to carry out a full investigation, we need to capture one of these events under favourable conditions. 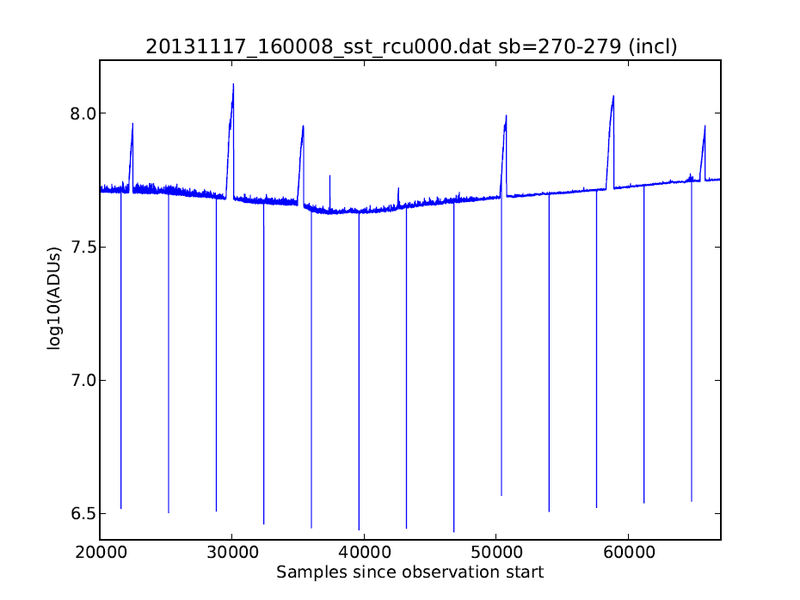 This occurred during some Tsys calibration observations in November 2013. Time series for one aerial for a small range of subbands. In the first figure, the drops are due to changes in pointing direction, causing a momentary loss in power. The problems are the ones that rise up like serrated spikes (we refer to them as dragon's-teeth). The nature of these is actually broad band, but not completely. They show up at several frequencies, but with a broad pattern at each. Olaf suggests that this might be due to the fact that there is a very high-rate time variation, which is something we'll need to investigate. 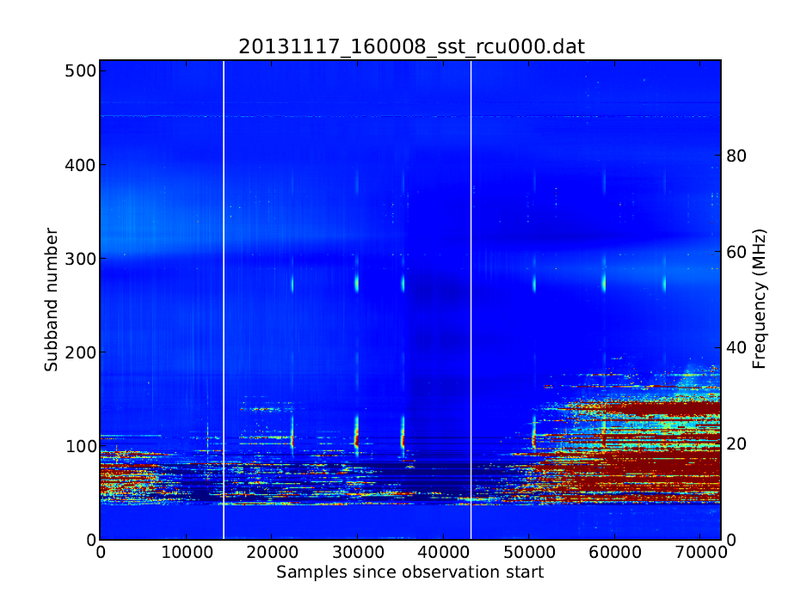 A 2D spectrum showing the multi-frequency nature of the RFI. Note also the large areas of shortwave radio interference. In any case, this is a very puzzling phenomena. But one which we are determined to figure out. Thanks to Menno, Antti, Juha, Olaf and Richard for helping out! This is interesting, but there's not enough information here to start a proper analysis. If it's RFI one needs to know frequencies, Az & El, antenna beamwidths, measurement bandwidth, absolute time (not samples) between events etc.etc. Are there nearby radar stations, airports etc? Non-obvious sources. e.g. do you have a car park gate using a microwave sensor? Is there a PLO in your downconversion chain that's lost lock and is searching? This has obviously gone on over a long time period. Is it via one antenna or an array?